Every year we do christmas photo sessions. They are usually the second week of November. We call it Photos for Toys. We give a discount on the photo session with the donation of a new and unwrapped toy. All of the toys get donated to the Cradle Beach Organization in Derby, NY. We chose this organization because the toys will go to local families. 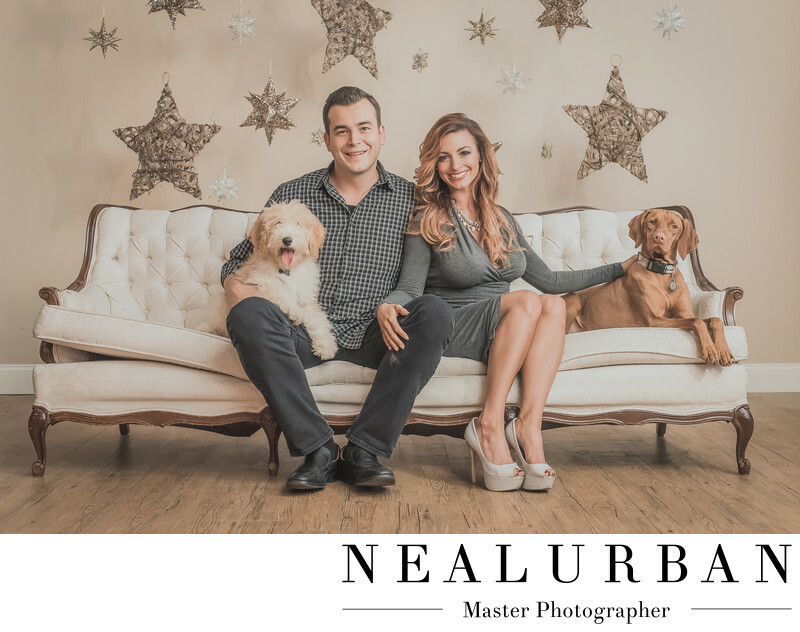 Every year we design a christmas set at Neal Urban Studio. We build it from the ground up. For this particular year we did two sets. We did one that looked like a living room scene with fireplace and giant picture of Santa Claus. The other looked like the image you see here. We found a ton of christmas ornaments all shaped like stars. We kept them either silver, or gold. Some were wooden also. We wanted to create a theme that was still representing the holiday, but not full on out christmas. This set had such a huge response. Sondra and family came in for this set! They asked if they could bring their dogs. We get special permission from the TriMain Center, where our studio is located, to to allow dogs in the building for photos. Families love this. These dogs are so cute! They were awesome! We had a bunch of vintage furniture that was on loan from one of our brides. We couldn't believe she had all this stuff in her basement. It was just what we were looking for! Every year we try to come up with really fun and different ideas for our Photos for Toys christmas sets. We started off with ten families. This past year we had ninety seven! This is for a great cause and you will leave with amazing christmas photo! We try to make this event bigger every year! Location: 2495 Main St Buffalo NY 14214.